Some redistricting rule just don’t easily mix. For instance, districts are to be contiguous and keep political subdivisions whole. But what if the political subdivisions themselves are split into little pieces? The obvious solution is to combine into one district the fragmented municipality and those that surround it. Nowhere is this more difficult in Pennsylvania than in the Lancaster Township/City area. 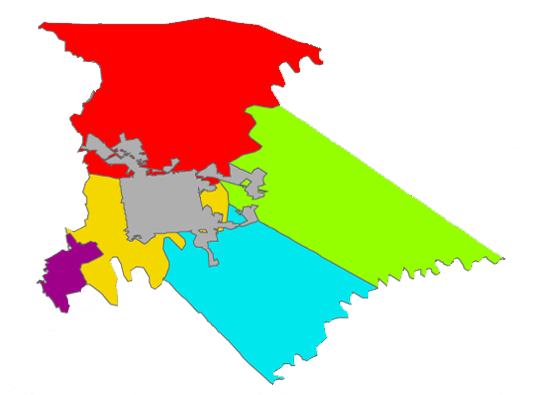 Each color is one municipality. Notice all the bits of color separated from the rest of their group. It doesn’t even show the little yellow triangle in the middle of the purple. In the 2000 election cycle, they tried to keep the districts in this area contiguous (even taking a fraction of a Voting District if it was surrounded by another area). The final results still left certain parts of each district not technically contiguous with the rest of the region. Thinking this meant that a non-contiguous municipality did not make a non-contiguous district, the following map resulted in the Holt Proposal. Lancaster Twp, Lancaster City, and Manheim all remained whole, although pieces of each did not touch other portions of the districts they were in. But some felt that this might be an issue. In the event that this is the case, Version 2 resulted. Lancaster Twp and City were each split to make their districts contiguous. 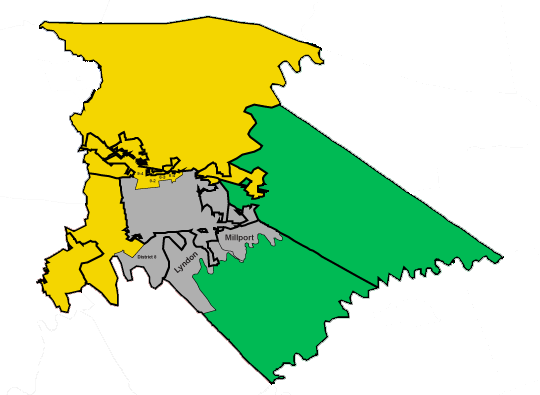 Only the Yellow and Grey districts were adjusted. The only exception is a tiny piece of East Lampeter Twp. Because this was not contiguous in 2000, I can only assume that it met some kind of exception. According to satellite views of the area, only five buildings are in the non-contiguous portion. If this is still an issue, then the little piece of land (a road, really) could be placed with the district as was done in other areas in 2000. Checking in with population sizes, we actually see an improvement. The two districts are closer to being equal than before. Personally, I feel that municipal boundary lines in this area could use an update. Tiny fragments that hold maybe 5 house just don’t make sense, especially when completely surround by another municipality. The Founders of PA felt that compact and contiguous made for better districts and, through these, better government. It seems the same principle would apply to City and Township boundaries. Setting aside these personal preferences, we must work within the existing structure. The adjustments add 2 more municipalities to the split list and 2 more wards. See how all this fits in with the big picture by revisiting the PA House Overview.